Originally from Twinsburg, Ohio, Brittani and Brandi came from a small section of the city from a working-class family. Regardless of their situation, Brittani and Brandi followed their passion for science and excelled academically, while frequently being the only African Americans in the class. Even with increased pressure to perform, Brandi and Brittani graduated with 4.0 GPA’s, gave a joint speech at graduation, and got accepted to Cornell University on scholarship. After completing medical school at Northwestern University Feinberg School of Medicine (Brandi) and University of Michigan Medical School (Brittani), the duo created “Med Like Me.” The site is intended to be a resource for youth to learn about the journey to a career in medicine, to share knowledge, and seek support. 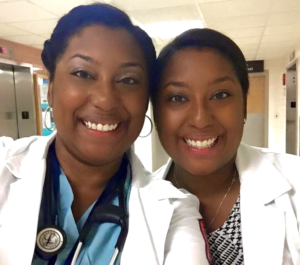 Brittani and Brandi sought to bridge the structural and institutional gaps that low income youth often face in envisioning a future in medicine such as not having a family comprised of physicians or having adequate support in reaching a seemingly impossible dream. Today, Dr. Brittani Jackson lives her mission to improve quality of life in her community as a Family Medicine physician at Aunt Martha’s Health & Wellness Vincennes clinic in Chicago Heights. To improve her patients’ quality of life, Dr. Jackson practices Aunt Martha’s integrated model of care that focuses on treating the whole person. Integration at Aunt Martha’s means coordinating their care around their physical, mental, and lifestyle needs. Similarly, Dr. Brandi Jackson is a Chief Resident at University of Illinois Chicago in Psychiatry to ultimately make an impact in addressing mental health in her community.